Hallie is sweet baby, only 1 or 2 years old. She came to rescue from a shelter in OK. They found her injured by the side of the road. They thought someone had hit her with their car and just driven off and left her. Hallie had no use of one of her back legs because her pelvis on that side was broken in at least 3 places and would not bear any weight. Her only chance to walk again was an expensive surgery with the specialists at Kansas State U Vet school. Hallie was so sweet and special and loving, even tho she was obviously in pain, we wanted her to have a chance to walk again. So with the help of sponsors and donations we raised the $$$$ it cost to pay for Hallie's surgery and care. 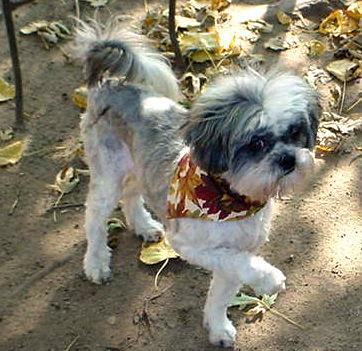 Then Hallie needed to remain in foster care for several months while she healed! During this time Hallie's foster mom received some disturbing news from K State. She sent this news to our group, "I have been alternating between tears & anger for our beloved Hallie. K State feels that she was not hit by a car. They felt if that was the case there would have been much more damage, internal injuries, bruising, organs possibly damaged. None of that was evident. Just a totally crushed pelvic bone. They couldn't say for sure it was intentionally inflicted on her, but all the evidence points to her having been kicked or hit to crush the pelvis. To even think someone could do that to this beautiful little girl makes me so very sad I cry, then I get mad...Oh gosh, in tears again...". Hallie is such a sweet girl, wonderful personality, We just cannot imagine a monster mean enough to do this to her or for what reason???? Two months went by and Hallie healed! She could walk again thanks to her sponsor angels! Hallie was adopted! She has a new family to spoil and love her and a fur brother and sister too! Her foster mom misses her but knows she will be loved and allowed to be the Princess she is supposed to be in her new home! We wish to thankfully acknowledge all of Hallie's Sponsors and Special Angels who helped us so much in providing funds to pay some of Hallie's vet bills. You all were Hallie's angels and your support meant more than you can ever imagine to Hallie and her foster mom! Thanks to a lot of wonderful people we received enough donations to pay for all of Hallie's surgery bills and Hallie's Rescue now becomes one of our Sponsor Success Stories! For you, the Sponsors are what made this rescue a Success! Alice & Bud Meredith sent a donation to Hallie's Medical Fund! Nikki & Brian Shakespeare, in loving memory of Muffy Lynn, sent a donation for Hallie's Medical Fund! Cynthia Adams sent a donation to Hallie's Medical Fund in Loving Memory of Penny! Pamella Leiter sent a donation for Hallie's Medical Fund! Suzanne Saunders sent a donation for Hallie's Medical Fund! Cheryl & Steven Lawler sent a donation for Hallie's Medical Fund! Alex & Sherry Miller sent a donation for Hallie's Medical Fund! Mary Kay Jung sent a donation for Hallie's Medical Fund! Tammy Benedict sent a donation for Hallie's Medical Fund! Barb Simmerman sent a donation for Hallie's Medical Fund in memory of Bonnijean and Dion! Raymond Reini & Nikki Payne sent a donation for Hallie's Medical Fund! Paula Schwartz sent a donation to Hallie's Medical Fund! Mary Hardin, in loving memory of Zeus, sent a donation for Hallie's Medical Fund! Barbara DeAngelo & Savannah sent a donation to Hallie's Medical Fund! Collette Douma sent a donation for Hallie's Medical Fund! Betty Kohlman sent a donation for Hallie's Medical Fund! Stacy Hopkins sent a donation for Hallie's Medical Fund! Kathy Luque sent a donation to Hallie's Medical Fund! Lana & Michael Hufnagel sent a donation to Hallie's Medical Fund! Ron & Julie Twichell sent a donation to Hallie's Medical Fund!